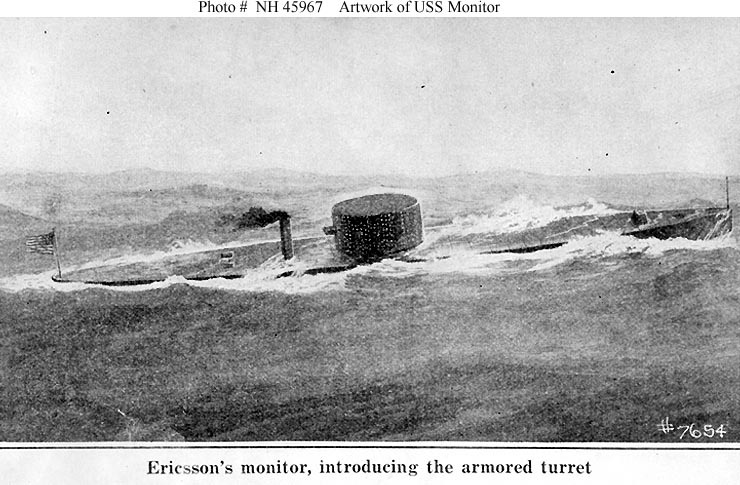 USS Monitor, a 987-ton armored turret gunboat, was built at New York to the design of John Ericsson. She was the first of what became a large number of "monitors" in the United States and other navies. Commissioned on 25 February 1862, she soon was underway for Hampton Roads, Virginia. 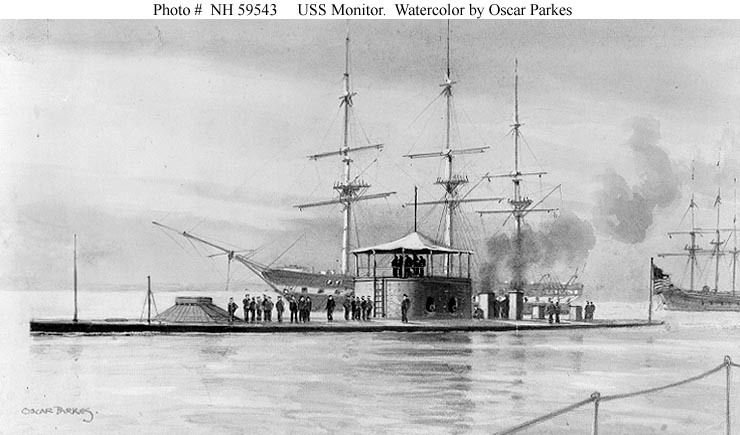 Monitor arrived there on 9 March, and was immediately sent into action against the Confederate ironclad Virginia, which had sunk two U.S. Navy Ships the previous day (see CSS Virginia (formerly USS Merrimack): Homepage and CSS Virginia destroys USS Cumberland and USS Congress). The resulting battle (Battle of USS Monitor and CSS Virginia), the first between iron-armored warships, was a tactical draw. However, Monitor prevented the Virginia from gaining control of Hampton Roads and thus preserved the Federal blockade of the Norfolk area. USS Monitor (1862) was the predecessor of the battleship. USS Monitor (1862-62). Courtesy Dr. Oscar Parkes, 1936. Following this historic action, Monitor remained in the Hampton Roads area and, in mid-1862 was actively employed along the James River in support of the Army's Peninsula Campaign. In late December 1862, Monitor was ordered south for further operations. Caught in a storm off Cape Hatteras, she foundered on 31 December. Her wreck was discovered in 1974 and is now a marine sanctuary. Work is presently underway to recover major components of her structure and machinery, to be followed by extensive preservation efforts and ultimate museum exhibition.